The appeal of fusion ... Nuclear fusion as a means of energy generation is very appealing. The products of fusion are generally not radioactive and therefore fusion is a 'greener' process than fission. A fusion reaction of particular appeal to nuclear scientists is the reaction between the two heavier isotopes of hydrogen - deuterium (hydrogen-2) and tritium (hydrogen-3). The current difficulty with fusion is the high temperature needed to overcome the electrostatic repulsion between nuclei. Not only is it very difficult to achieve these high temperatures, but finding materials to contain such high temperatures is also a challenge. Chadwick's discovery of the neutron, opened new avenues of research into reactions. The fact that neutrons had no charge encouraged their use in bombarding the nuclei of atoms. The idea was that if the nucleus of an atom of a particular element could absorb an extra neutron, then a different isotope of that element should be produced. Neutron bombardment of uranium was also considered to be a way of producing elements heavier than uranium - the trans-uranium elements. Otto Hahn, Fritz Strassmann and Lise Meitner worked together on the neutron bombardment of uranium in Germany in the 1930s. Eventually Meitner, being Jewish, had to flee Germany and went to work with Bohr. Hahn and Strassmann continued to work on the neutron bombardment of uranium (atomic number 92) and were stunned to discover barium (atomic number 56) as a product of this bombardment. Within weeks, it was discovered that neutrons were also released during the fission of uranium and that these neutrons could cause the splitting of more uranium nuclei and lead to a chain reaction. The first step in the fission of uranium-235 involves the formation of unstable U-236 nuclei by bombardment with neutrons. Each unstable U-236 nucleus breaks down into a Kr-97 nucleus and a Ba-137 nucleus accompanied by the release of three neutrons. Animation by Prof. Horstmann. Simple animation of nuclear fission. In the first frame, a neutron is about to be captured by the nucleus of a U-235 atom. In the second frame, the neutron has been absorbed and briefly turned the nucleus into a highly excited U-236 atom. In the third frame, the U-236 atom fission, resulting in two fission fragments (Ba-56 and Kr-36) and three neutrons, all with large amounts of kinetic energy. Skip this part, if to technical, continue reading below. Nice animations etc. Table of cross sections, U-235. Figures of cross sections, U-235:  type-1:  type-2:  type-3. Table of cross sections, U-236. Figures of cross sections, U-236:  type-1:  type-2:  type-3. Table of cross sections, Ba-137. Figures of cross sections, Ba-137:  type-1:  type-2:  type-3. Nuclear fission can take place spontaneously or it can be induced by bombarding an atomic nucleus with moving particles such as neutrons, protons or alpha particles or with electromagnetic radiation in the form of gamma rays. It occurs most readily with heavy elements such as uranium and plutonium. The two nuclei formed as a result of this bombardment are both positively charged and repel each other. The fission of one kilogram of uranium releases as much energy as is obtained from burning approximately 3 000 tonnes of coal. It was mentioned earlier that, as well as new nuclei, several neutrons are formed from the fission of uranium. These neutrons can strike other uranium nuclei, which then release more neutrons. The extra neutrons can then split further uranium nuclei, and so the process goes on and can be self-sustaining in what is known as a chain reaction. Then destructive power of such a fission reaction was exploited in the atomic bombs used to end the Second World War. Today we see constructive applications in nuclear reactors, which effectively harness the fission process for electricity generation. Nuclear fission is the basis of all existing nuclear power stations. Process through which an atomic nucleus splits into two approximately equal parts with the release of large amounts of energy. Fission has been observed for many nuclei of mass number A greater than 200 (eg, uranium 233, plutonium-239) and can be caused by neutrons, photons, electrons, protons, deuterons and alpha particles . The first fission was discovered that uranium bombarded by neutrons. With thermal neutrons, the effect is due to uranium 235, only present in natural uranium at a rate of 1 atom for 139 238 atoms. Processus par lequel un noyau d’atome se brise en deux parties approximativement égales avec dégagement d’une grande quantité d’énergie. La fission a été observée pour beaucoup de noyaux de nombre de masse A supérieur à 200 (ex. uranium 233, plutonium 239) et elle peut être engendrée par des neutrons, des photons, des électrons, des protons, des deutons et des particules alpha. Le premier phénomène de fission découvert fut celui de l’uranium bombardé par des neutrons. Avec des neutrons thermiques, l’effet est dû à l’uranium 235, présent seulement dans l’uranium naturel, à raison de 1 atome pour 139 atomes d’uranium 238. At the same time as the larger fragments, neutrons are released during fission. With these free neutrons, the fission reaction can become, in certain conditions, self-sustaining and lead to continuous production of energy. This is the basic operation of the reactors. The fission of uranium 235 with neutrons produces a thermal energy of about 200 MeV. About 85% of this energy appears as kinetic energy (energy due to the speed of a moving body) of fission products and ultimately results in heat generation. Yet this enormous energy represents only 0.1% of the mass energy contained in a heavy nucleus. In other words, the energy release comes from a weight loss of 1 in 1000, and this according to the Einstein relation. Prof. Horstmann said in 2009, \(E = \Delta t c²\). En même temps que les gros fragments, des neutrons sont libérés durant la fission. Grâce à ces neutrons libres, la réaction de fission peut devenir, dans certaines conditions favorables, autoentretenue et conduire ainsi à une production continue d’énergie. C’est la base du fonctionnement des réacteurs. La fission de l’uranium 235 par des neutrons thermiques produit une énergie d’environ 200 MeV. Environ 85% de cette énergie apparaît sous forme d’énergie cinétique (énergie due à la vitesse d’un corps en mouvement) des produits de fission et se traduit finalement par un dégagement de chaleur. Cette énergie pourtant énorme ne représente cependant que 0.1% de l’énergie de masse contenue dans un noyau lourd. Autrement dit, le dégagement d’énergie provient d’une perte de masse de 1 pour 1000, et ce d'après la relation d’Einstein. Prof. Horstmann dit en 2009 que \(E = \Delta t c²\). If one could split all the atoms in one kilogram of uranium-235 would produce an energy equal to that provided by three million kilograms of coal. However, we saw that natural uranium contains only a small proportion of uranium 235. To get closer to the theoretical complete combustion of all the atoms in the uranium is used batteries or regenerative incubators in which the fertile material produces more fuel than it is burned. For the chain reaction takes an explosive nature, it is necessary to have a certain amount of uranium 235, is the critical mass. To make a bomb, we calculate the sub-critical masses, combined into one critical mass to trigger the explosion. Si l’on pouvait fissionner tous les atomes de 1 kilogramme d’uranium 235, on obtiendrait une énergie égale à celle fournie par 3 millions de kilogrammes de charbon. Toutefois, nous avons vu que l’uranium naturel ne contient qu’une faible proportion d’uranium 235. Afin de se rapprocher de la combustion théorique complète de tous les atomes contenus dans l’uranium, on utilise des piles régénératrices ou couveuses dans lesquelles la matière fertile produit plus de combustible qu’il n’en est brûlé. Pour que la réaction en chaîne prenne un caractère explosif, il est nécessaire qu’il y ait un certain quantité d’uranium 235, c’est la masse critique. Pour réaliser une bombe A, on calcule des masses sous-critiques, réunies en une seule masse critique pour déclencher l’explosion. By merging the nuclei of lighter elements, it causes the formation of nuclei of heavy atoms with energy production. In the thermonuclear bomb, the temperature required by the reaction (about 5 million degrees) is provided by the previous explosion of a bomb A. In the industrial sector would require the energy released by fusion is greater than the energy used for heating gas. It therefore seeks the means of producing temperatures never reached before in the industry. We can use deuterium (D or 21H), a natural isotope of hydrogen whose nucleus (deuteron) is a shot used in accelerators. Deuterium is the basis of heavy water. Par la fusion des noyaux des éléments les plus légers, on provoque la formation de noyaux d’atomes lourds avec production d’énergie. Dans la bombe thermonucléaire, la température nécessitée par la réaction (de l’ordre de 5 millions de degrés) est fournie par l’explosion préalable d’une bombe A.
Dans le domaine industriel, il faudrait que l’énergie libérée par la fusion soit supérieure à l’énergie employée pour l’échauffement du gaz. On cherche donc les moyens de produire des températures jamais atteintes jusqu’alors dans l’industrie. On peut utiliser le deutérium (D ou 21H), élément naturel isotope de l’hydrogène et dont le noyau (deuton) est un projectile utilisé dans les accélérateurs. Le deutérium est à la base de l’eau lourde. The energy released by fusion of all atoms in one gram of deuterium gas, equivalent to the energy released by burning about 2.8 million kilograms of coal. We may also use tritium (T ou31H) radio-isotope of hydrogen, whose nucleus is the tritone. The fusion reactions leading to helium He. Deuterium is a constituent of ordinary water (1 / 5000), the water of all seas represent the energy point of view, the possibility of life 10 billion years with the current energy consumption. L’énergie libérée par la fusion, de tous les atomes contenus dans 1 gramme de gaz deutérium, équivaut à l’énergie libérée par la combustion d’environ 2 800 000 kilogrammes de charbon. On peut également employer le tritium (T ou31H) radio-isotope de l’hydrogène, dont le noyau est le triton. Les réactions de fusion aboutissent à l’hélium He. Le deutérium étant un élément constitutif de l’eau ordinaire (1/5000), l’eau de l’ensemble des mers représenterait au point de vue énergétique, la possibilité de vivre 10 milliards d’années avec la consommation actuelle d’énergie. 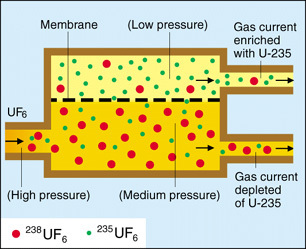 First of all lets look at two way's uranium enrichment: the gas centrifuge, which promises vast efficiency improvements and far less power consumption than the previous way (gas diffusion) enrichment. “Enrichment” or more particularly “uranium enrichment” is probably one of those phrases that the average person hears on television or reads on the Internet and has only the vaguest concept of what it means. They likely think “it’s bad” and “it has something to do with uranium, which I think is bad, for some reason”. 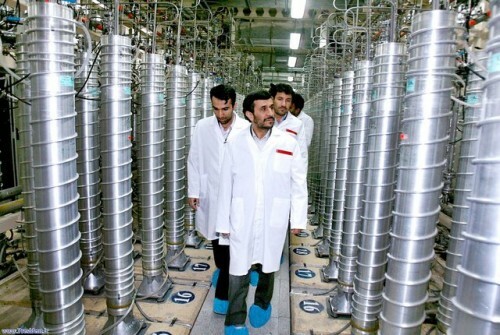 Commentators and journalists decry the idea that Iran *gasp* might have access to uranium enrichment. Our leaders both domestic and international, loudly thunder that lesser nations shall not be allowed to develop enrichment. The world of the nucleus is a secret world, shielded from everything else by the cloud of electrons surrounding it. The electrons do all of the interacting, the nucleons do nearly nothing. The only hint they give to their existence is their charge, which is balanced by the electrons, and their mass. Practically all of the mass of the atom is in the nucleus. Different isotopes of elements have different masses. They have the same number of protons, and hence the same charge and the same chemical nature, but different masses. From a chemical perspective, there’s no difference between most isotopes (with a few exceptions, like normal hydrogen and deuterium). But from a nuclear perspective there can be a huge difference between two naturally occurring isotopes. Lithium is a good example. Natural lithium is 90% lithium-7 and about 10% lithium-6. Chemically they’re the same. You can make batteries from lithium-6 just as well as you can make batteries from lithium-7. But from a nuclear perspective, they’re really, really different. Lithium-7 has almost no appetite to absorb neutrons, whereas lithium-6 has a HUGE appetite to absorb neutrons. Uranium is in an analogous situation. Uranium-235 and uranium-238 are the two naturally occurring isotopes of uranium. One of them is far more common than the other. Can you guess which? Yeah, it’s the one that we’re not so interested in. Kind of like how when your toast falls down it always seems to land on the buttered side. Nevertheless, we’re a lot more interested in uranium-235, which is only 71 out of every 10000 uranium atoms than we are about uranium-238, which is the other 9920 out of 10000 uranium atoms. (1 atom out of 10000 is uranium-234, but we won’t worry about that right now). Enrichment is the process where you separate one kind of isotope from another, and the overwhelming reason to do it is because you intend to use your product in a nuclear process. Because if you want to do a chemical process, you usually don’t care too much about what kind of isotope mix you have. Sometimes, but very rarely. So how do you conduct enrichment? Well, your toolbox is pretty sparse. All of the chemical tricks that are so commonly used to separate one thing from another don’t work when you’re dealing with one kind of element, because chemically it’s all the same. You have to try to separate one thing from another based on something that’s different between the two. Almost always that difference is mass. Lithium-6 has six units of atomic mass, lithium-7 has seven. Uranium-235 has 235 units of atomic mass, uranium-238 has 238. So there’s a difference there. It’s more pronounced for lithium than uranium, but it’s there nevertheless. Separating uranium is a big deal because U-235 is fissile and U-238 is not. The original motivation to separate uranium was to make a bomb during the Manhattan Project. The first nuclear bomb ever used in war, 72 years ago today, was based on separated uranium-235. And enrichment has had a bad rap ever since. To separate U-235 from U-238, you need to put them in a chemical form where it’s easier for them to get away from one another. Thank goodness for fluorine! Uranium hexafluoride (UF6) is a gaseous form of uranium. It has one uranium atom in the middle of six fluorine atoms. It looks a lot like one of those little jacks my sister used to play with. There’s another aspect to UF6 that’s really important. If fluorine itself had a number of different isotopes then this whole idea wouldn’t work. For instance, if there were isotopes of fluorine that had mass numbers of 18, 19, and 20, then you could go build a UF6 molecule and one of its fluorine’s might be 18, and another would be 20 and another could by 19, and that mass difference from uranium could get “lost in the noise” from all of the different isotopes of fluorine. But fortunately, that’s not how it works. Fluorine has only one natural isotope, number 19. So when you go add six fluorine's to uranium, you know that they’re all going to be 19. Any difference in mass from the molecule all comes from the uranium, not the fluorine. So we’ll do a little math. If you have a uranium atom that has a mass of 235, and you go and add six other atoms each with a mass of 19 to it, what do you get? (235 + 6*19) = 349. (I won’t lie, I used my calculator) And if you have a uranium atom with a mass of 238? (238 + 6*19) = 352. So the whole trick in uranium enrichment is to separate molecules in a gas that have a mass of 349 from molecules that have a mass of 352. Folks, that’s not very much, and you can see why uranium enrichment is hard and expensive. But, thanks to the gaseous nature of uranium hexafluoride and the monoisotopic existence of fluorine, it’s possible in the first place, where otherwise it might not be. Now we have only a little bit more lithium feed (25%) than we expect as product—in other words, most of the lithium-7 ended up in our product stream rather than in the tails. Seems like a better way to go, right? Well, maybe. It still depends on a lot of other things, like how hard it actually is to do the separation. Uranium Oxide Solar Panels, part 3. Did you know that uranium dioxide is a semiconductor? In fact, it’s a really good one! That means that you could make solar panels, LEDs, and computer chips from it…can you imagine uranium oxide(nuclear waste) solar panels? Nuclear power plants run on uranium fuel. In the reactor, uranium atoms are split through a process known as fission(look above) When atoms are spilt, they produce a large amount of energy that is then converted to heat. The heat boils water, creating steam that is used to turn turbines, which spins the shaft of a generator. Inside the generator, coils of wire spin in a magnetic field and electricity is produced. Nuclear power plants in the United States use two types of reactors to achieve this process: pressurized water reactors(see animated PWR - just below) and boiling water reactors(see animated BWR - bottom of page). Pressurized Water Reactors (PWR) keep water under pressure, so the water heats but does not boil. The heated pressurized water is run through pipes, which heat a separate water line to create steam. The water to generate steam is never mixed with the pressurized water used to heat it. Boiling Water Reactors (BWR) heat water by generating heat from fission in the reactor vessel to boil water and create steam, which turns the generator. In both types of plants, the steam is turned back into water and can be used again in the process. Lets get inside the BWR ... .